I enjoyed the forum of being in a circle of fellow soul-journeyers. I learn so much from others readings and I hope that I can contribute to other’s well being in a similar fashion. Every time I participate in Soul Messages my life seems to undergo a shift in varying degrees of significance and profundity. I am in awe of the wisdom with which Cheryl conducts these forays into the Akashic Records. I had an hour’s general reading. I was nervous before the call but the minute Cheryl said hello I relaxed. A truly gifted and talented lady, I loved my reading and felt completely happy to open up and get the questions I wanted answered. I knew the answers were coming from a higher source as there were so many things that were said that Cheryl couldn’t have possibly have known and everything was spot on. Great energy, great guidance and a lovely humour that suited me down to the ground, it was as if she had known me for years and we were the greatest of friends. I will be back for another reading and have recommended you too many. So if your reading this just do it, don’t hesitate and enjoy. In early 2010, I discovered Edgar Cayce and his use of what was called the Akashic Records. I spent almost an entire month reading and searching the transcribed archives of his readings to learn more about the Akashic Records. I was completely fascinated by his readings and work with the Akashic Records, yet I also realized that he had passed away in 1945. I found Cheryl?s website and book and I was able to read portions of her book on Amazon. I wanted an Akashic Record reading and I figured this was the way I was going to do it. Before having an Akashic Record reading with Cheryl, I had never done anything remotely close to this. Five minutes into the reading I knew the information was coming from a higher place. How did she know these things? I hadn?t told her any of this. Why did everything make so much sense? She knew little about me. Why did I feel completely different at the end of the reading? That reading changed my life. I was able to let go of things that I had held onto for no reason after that reading. I now understood why things had happened to me in my life. I also understood my relationships with people in my life much better. The best part of all was I could now see my path. I have since learned to open my own Akashic Records through Cheryl?s Sage Path I class. I have also attended Sage Path II and I can open up other people?s Akashic Records just like Cheryl. I am now able to give others the same experience in the Akashic Records that I had during my first reading. I just wanted to thank you for everything today. I know that was a big reading for both of us. I had a feeling it was going to be. ?Everything you said resonated with me. I’m sure as the reader sometimes you are afraid to even repeat what comes to you for fear the person will reject it. I want you to know that it felt like you set my soul free today.? Everything you said makes sense for what I know about myself and how I have felt my whole life. How can I ever thank you enough for your part in bringing me to the Akashic Records? My life has taken on such a quality of sweetness . . . and most of all a trust in my own self that nothing else in my life thus far has been able to give me. In case you have forgotten how important your work is on the planet, know that even if only ONE person (me) experiences such deep changes in her life, it will have been more than worth it. I enjoyed hearing others’ messages & found many of the their messages also resonated with myself. I was really amazed how, in such a limited amount of time, I was able to learn so much from asking just one question. Soul Messages is a nice introduction not only to Akashic Records work, but what group work in the Akashic Records makes possible. I found so much value in asking my personal questions and receiving answers that truly and profoundly transformed my experience for the better, and I was also very pleased to be able to share this process with a circle of others. I felt a kinship that I was not expecting and I feel honored to have been a part of such a gathering. I learned that the lessons that each of us are here to learn can benefit the Souls that we come into contact with, and that is such a wonderful feeling to share. I am so thankful you crossed my path! Thank you so much for the Akashic Reading. Setting up the appointment from your website was a breeze. My reader was able to clarify and make the connection of an unusual pleasurable sensation to a past life. That was very helpful. The suggestions on how to continue to heal this area of my life were spot on. Thank you so much for your services. My free Akashic Records reading [in the Community Clinic] was a very pleasant and insightful experience. Thank you Akashic Records School for this opportunity. Thank you for the amazing call and insights. Until the call, I really didn?t understand the mission of my new business and who I was meant to serve. Focusing on the new business concept and the resulting naming/branding system makes total sense. Now I feel like I can finally move forward with alignment in Divine will. Thank you. Thank you. May you be blessed with the love you are. 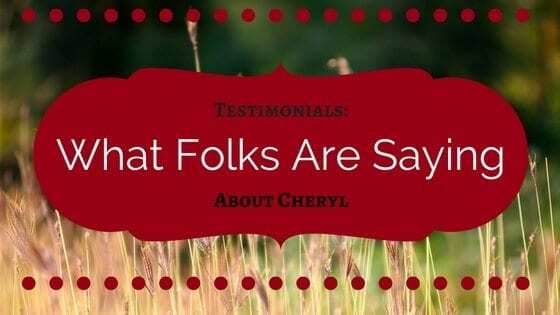 The first time I spoke with Cheryl I felt like reconnecting with a soul-sister. The energy between us was just beautiful and what touched me most was this joy and love that flowed out of her being. The reading sessions I had with her always rebalanced my energy and helped me see the truth and wisdom that only can come from Source. Cheryl has this magical ease to convey the Knowing in the most beautiful, elegant possible way. Her high sense of integrity is always leading in every reading session she conducts, an extremely humbling experience. I am grateful our paths have crossed in this lifetime. I googled Akashic Record Reading and found a ?connection? with Cheryl?s site. I liked the smile on your face. I saw your ?sparkle?!! After having one session with you, I knew you were the true thing. You were a gift from God to help me get over my hurdles that are holding me back in being the true Me and by showing me how to heal. I would like to thank Cheryl and the school for offering this opportunity to me as a Reader . It has helped me grow and gain the confidence I needed in the information received when offering a reading. It has been such a rewarding and humbling experience to be able to offer guidance while connecting to the purest of Source? information. With infinite love and gratitude. In Sage Path 200, I found myself. The true self that was hidden under all the mess that I thought I was me. This workshop has given me so much more than that ? it has opened up a new and better world for me. While I was thinking about this I thought where would I be right now if I had not taken this workshop? Most likely still be at a job I hated, having no hope for the future, not speaking up for what I believe or myself. Hating myself (yes I did before this all started for me) Probably still thinking everything negative that happened was because of something I did. I could go on and on here, but I think you see where I am going with this. This workshop has given me a new life?..WOW!! I believe that everyone should have the chance to see for themselves who they really are. In my own opinion there is not a person out there who is able to teach this as well as you or that has more knowledge about the records. I get that you truly care about your students. My Sage Path 200 experience was an extremely successful one. Cheryl is a great teacher and knows how to bring out the best in everyone. She is always there to support the process of every student, spots the blockages if any and helps releasing them. I see the workshops as a solid platform where students can create a virtual bonding of trust and support with each others and build up their learning process. All the work we had to do on the workshop day and the assignments post the workshop was carefully chosen by Cheryl in order for us to experience the most of it and cover every single area on the course. Slowly but surely I saw my awareness expanding and my knowledge increasing as well as my confidence in being part of that unique space of knowing. I witnessed my own progress and shifts on that amazing journey. I would not change a thing related to the course, the way it is prepared and implemented. For me it was a complete experience. Thank you Cheryl for being such a great master. My experience with the Sage Path Intensive has been nothing short of amazing. Learning to open my Akashic Records and those of another has been a life changing experience. The monthly directed study with Cheryl really helped me uncover, release and heal issues I?ve been struggling with for over 50 years. The Sage Path Intensive has helped me reconnect to my real self. Thank you for the Initiation last Friday. It was a great experience! Very easy to understand step by step instructions and you create a very nice atmosphere ? relaxed and joyful but serious at the same time. I enjoyed it very much. Cheryl?s writings and teachings about the dynamic, energetic view of the Akashic records are profound. What was a revelation in the Sage Path 1 workshop, however, was how little time she spent on the ?theory? ? much of this is contained in her excellent books ? but how she guided us gracefully right into the work so that, before I had time to wonder if I could do it or worry that I would ?get it right?, I was already doing it! We practiced going in and out of our own records in various ways and with some probing questions suggested to us so that, by the end, I didn?t just have a good conceptual grasp of the ideas, but confidence that I could access my records at will. I received much useful guidance from the different perspective of the records, both in the workshop and in the follow up exercises over the next few months, together with answers to questions which had previously eluded me. I thoroughly recommend this workshop to anyone wishing to enhance their spiritual practice with a deep and reliable connection to the guides of their soul?s Akashic Records. I got so much from participating in Sage Path 200. The fact that you can open the records of anything like animals, businesses, the earth etc amazes me! The profound healing I received from the records is another benefit and I am excited to practice more of this with potential clients. Plus having a nice group of people who we can do swaps with when needed in the future :) Cheryl, you are an amazing teacher! I feel that you ask questions on a much deeper, soul level and I haven?t found anyone doing this kind of work. You are so humble, down to earth, very understanding, supportive and just so easy going! I am so happy I got guided to you. I am very pleased to receive a free reading from a student of the Akashic Records school. She was very attentive and I felt like there was a connection. I made an intention asking the universe to send me the answers through this reader, before we began the session. The reader answered all of my questions and I felt that she tried to help me by giving her best effort. So I am thankful for this free reading. I felt at ease after the session and felt very good. Her explanation makes sense to me. I highly recommend Akashic Records School for reading Akashic records. My reading was very life affirming. It let me know that my intentions are valuable and correct to my path. I feel very validated and confident to continue. This reading was a great experience and brought me clarity on what I need to be focusing on in my personal life and my business. In fact, I made a decisive decision shortly after the reading and am excited about the expansion, which was the theme of the entire reading. Very Grateful. It is really a great opportunity! With every reading I get more and more confident in myself and feel more comfortable working with people whom I have never seen. it is not possible to go on developing as a reader without having this experience. Thank you for doing this! A phenomenal teacher who provides great tools and great experience! I so appreciate Cheryl?s teaching to read the Akashic Records for self and other. She is a phenomenal teacher who provides great tools and great experience! I am very blessed to be able to witness and share the readings. It?s a balance with trust to be able to give a reading, and it?s just a lite, fun-filled experience. I am always laughing because the Akashic Records provide so much joy when in their presence. Wonderful, amazing do not come near to the experience of being a Reader?but wonderful and amazing it is! As my practice as a reader deepens, I find myself more able to trust the flow of information from the Records and trust myself to handle with grace whatever challenges I am given in the process. This is allowing me to settle and trust myself more in dealing with whatever I encounter in my life. First of all, I would like to thank The Akashic Records School for giving this chance to have a free reading. Second and not least, for the student that made my reading. Good work! I think that these possibilities are very important nowadays. I work with crystals ( crystal grids and so on, with meditation) and already did by myself two important meditation times using those tools to access my akashic records. The first one was just channelling. The second one was intended. But having someone to give you the insights by reading your records is different. The ressonance becomes more clear. Thanks again and keep the good work. I have had a reading with one of your great students. I can only give my highest Praise to the school. I have learned a lot about myself, and I have already benefitted from this experience, as I have learned to trust my self, and actually love myself, even though I know the road is still long. I have finally found my way home to my soul, and now I am ready to fly. Thank you. This is an incredible opportunity to have your Akashic Records read. The students take this very seriously and are kind and compassionate. They offer guidance and answer your question to the best of their ability. Wonderful people,and a way to find ones soul purpose on their journey. As I go deeper onto my journey as a woman and guide, I come to realise one of the biggest gifts studying in the Akashic Records and connecting with Cheryl has given me. And this is the gift of Presence. I used to live between the past and the future. Between guilt and fear. Now I live in the present moment. I connect with my breath and I am at peace. And yes, we all have moments when we get pulled back by old patterns but the difference is, that I now have the tools and knowledge on how to bring my awareness to the present moment and how to experience life as it is. For this priceless gift and knowledge, I thank you from the bottom of my heart!